lots of snow already this year. 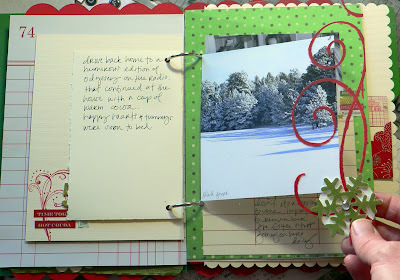 this page is craft plastic that is housing one of my favorite snowy photos. i used a heidi swap mask and painted the swirl. the snowflake is from last years stash from imaginiesce. dec 6. again, these photos do not scream holiday activity. but i love this picture just the same of the three girls looking at one of my recent albums. it was a chance to document their love for the photos and words i love to create. paper is from zany zinnia's december add on kit. letter stickers are making memories. 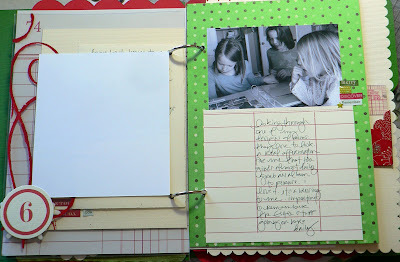 i printed the journaling block from one of katie pertiet's digital kits. the number card is from every jot and tittle. dec 7. the believe page, bo bunny patterned paper from the zany zinnia kit, was coincidentally placed to correspond with the first sunday in december. it happened on 'accident'. i decided in service to keep my notes from church and put them in my daily book. the message was on mary's magnificat and was a beautiful and timely message. i will be glad to have these notes in future days. very pleased with how these kiddos cooperated for this shot. had to add to sunday's additions. as simple as i tried to keep this book, i am finding that there are more than 2 photos on some days. that's okay. there are no hard fast rules to keeping a daily book. it's been such a pleasure to work on. 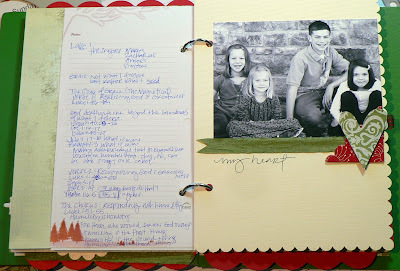 i used my new handy-dandy scallop punch from stampin up. 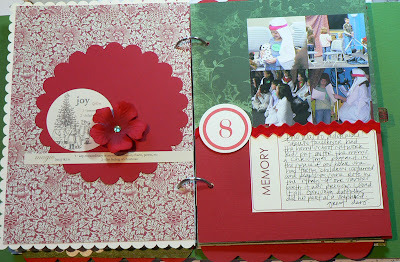 the photo corner is from making memories february valentine chipboard pieces. the heart, heidi swapp chipboard, is covered with basic grey from last year. (gee i need to blow through some of this stash. dec 8. ahh!!! monday our home school group had a christmas party. the group of multiple aged children were led in a pageant to present to us mom's. it was just precious!!! even the 13 year old cooperated. that was just a blessing. anyway...i think i need to do an entire mini album with all the photos i took. it was a great morning. hey...if you are reading this, you have spent a little time with me, and thanks!!! Your Dec. daily album is coming along beautifully! 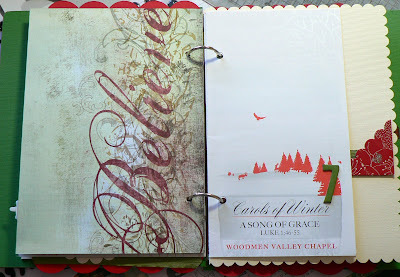 I love the way you kept your bulletin & notes from church - may need to copy this idea (or at the very least, the program from our Christmas musical tomorrow).